Many academics use their summers to do some research, or to rest. 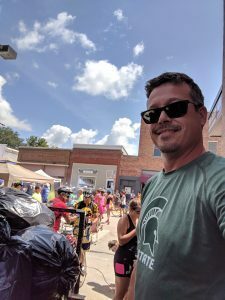 Justin Jagger, an academic specialist at the Eli Broad College of Business, spent the summer of 2018 doing another R: riding. His bike, to be exact. The whole way across the state of Iowa. 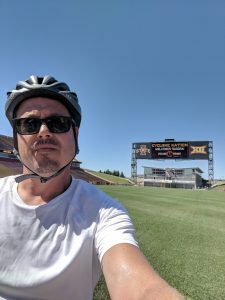 Jagger, who teaches in the Department of Supply Chain Management, rode in this year’s the Des Moines Register’s Annual Great Bicycle Ride Across Iowa, known as RAGBRAI. It bills itself as the oldest, largest, and longest recreational bicycle tour in the world, with thousands of people annually participating in the 468-mile, 7-day ride. His father-in-law talked Jagger into joining him and Jagger’s brother-in-law in this year’s event. Jagger’s longest previous ride before agreeing to go? Maybe 8 miles. “It became sort of this experience and a goal. It was creating a goal and seeing if you can do it,” Jagger said. “I had ridden a bike for quite a while, but I’ve never road-biked, and never to this extent,” Jagger said. He started training this past winter. “You start going to the IM West and start riding the stationary (bikes),” Jagger said. “I bought a road bike proper in March, and then you start trying to go out for rides” of up to 20 miles in training. 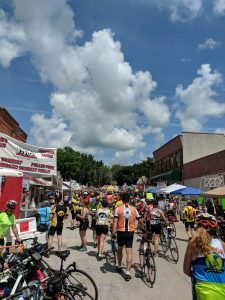 RAGBRAI required rides of 60 miles most days, and 100 miles one day. “It was sort of a simple seven days. You wake up, you ride your bike, you land and camp out for the night; you wake up and you do it again,” Jagger said. For a supply chain person, Jagger found it fascinating to watch a huge, rolling event take shape. “From a logistics standpoint, the entire state is behind this. 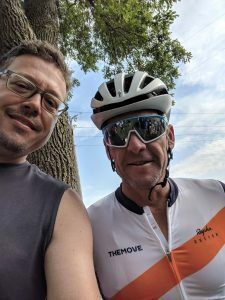 They have approximately 10,000 to 12,000 people on bikes at any given point in time, so just witnessing the orchestration of the event was amazing,” he said. “Basically every town we stopped in, you had food trucks. The same food trucks basically moved with us,” Jagger said. “In essence it was almost like a traveling carnival. The whole mass just moved across” the state.